Maintained by B&NES Bereavement Services. Strimmed once a year (November/December) and mowing of pathways during the growing season. Gate for vehicles and pedestrians at northern end. Kissing gate from Perrymead at south-western corner. Access to some graves from May-November may be limited by the undergrowth. 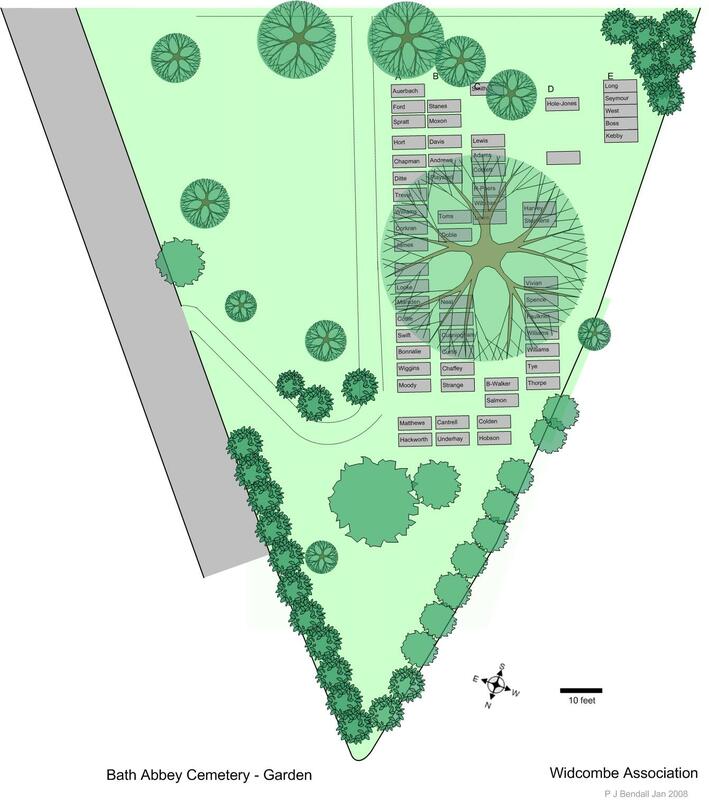 The Abbey Cemetery is located in a triangle of land between Ralph Allen Drive and Perrymead. 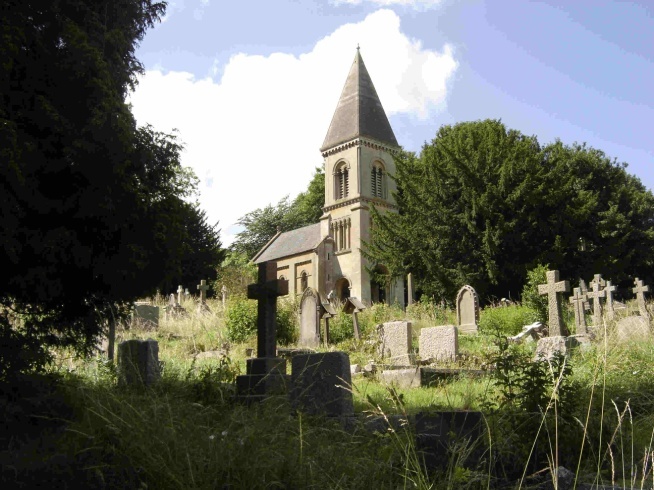 It opened in 1844 as a private Anglican cemetery. It was financed by William John Brodrick (7th Viscount Midleton) who was rector of Bath Abbey in the period 1839-1854. He had purchased the land from the Catholic Bishop Baines – the Catholic Cemetery is adjacent. It was designed in 1843 by John Claudius Loudon (1783-1843) a Scottish landscaper who had landscaped various farms and property, set up a school for training on farming and had become a city planner, in particular concerning open spaces. He produced designs for two other cemeteries: Histon Road, Cambridge and Southampton Cemetery (in 1842–3). The cemetery’s chapel was designed by George Phillips Manners (1786-1866) of Bath who was the Bath City Architect during the period 1823-1862. 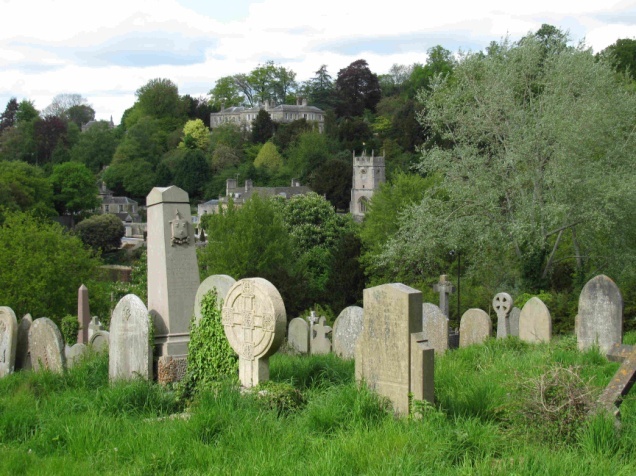 When opened, further burials within Bath Abbey were stopped and some inscriptions at Bath Abbey Cemetery refer to spouses being buried in the Abbey. 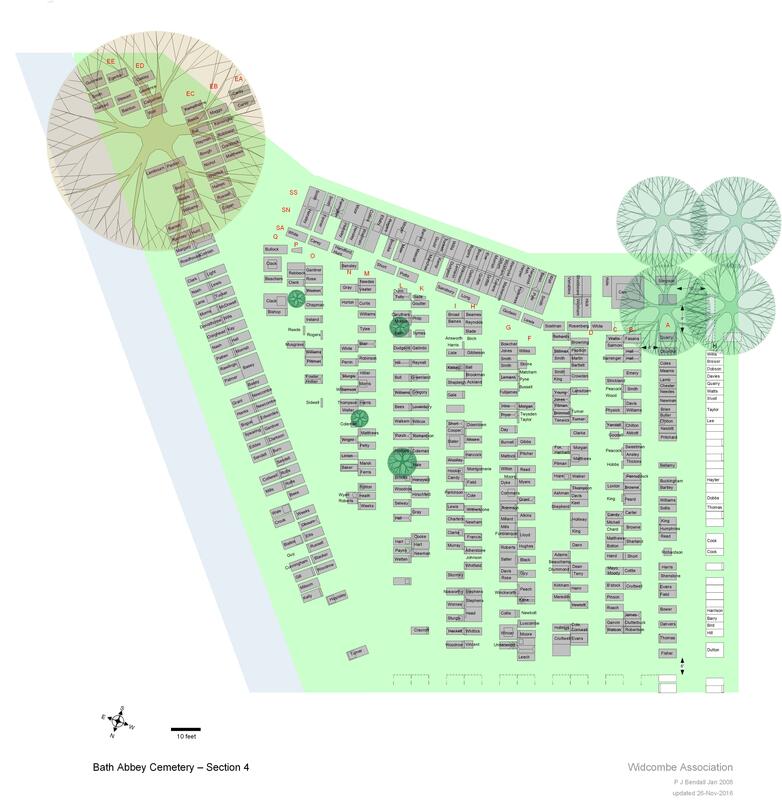 The site covers 2ha (5 acres), and overlooks the town with a view of the Abbey’s tower and, beyond that, Lansdown. Over its approximately 225m length, the elevation drops by 20m going from south to north. 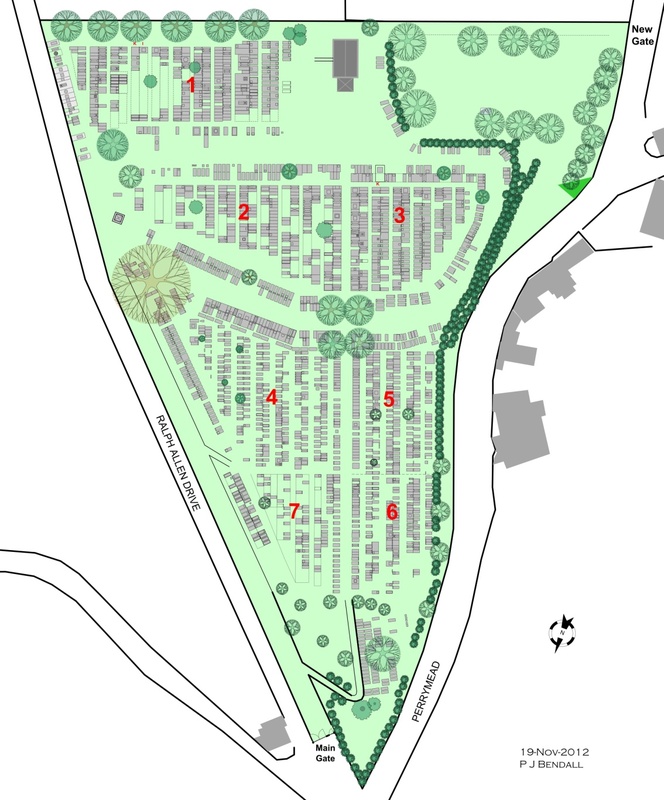 The cemetery is laid out along a major axis from the chapel of rest at the summit to the lower end of the cemetery in an almost south to north alignment with the main path running along this. (The axis is about 20 degrees west of North.) The major axis is crossed by a wide curving path. The number of burials was about one per week in the mid-19th century but has then diminished steadily so that now it is less than three a year. 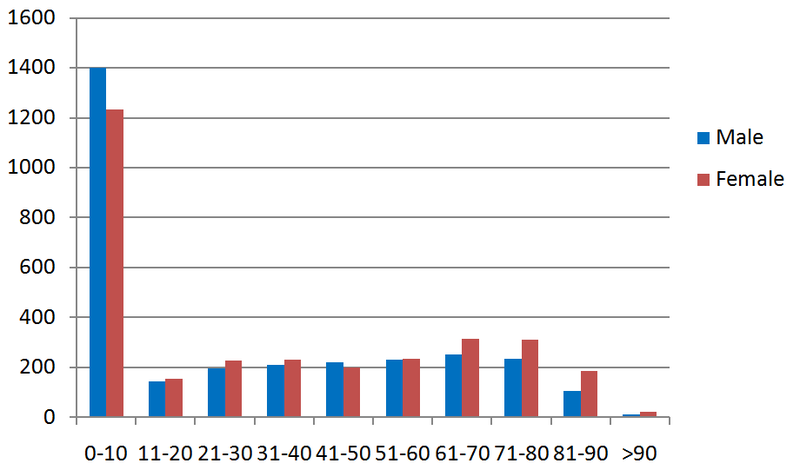 The figure above summarises the number of burials by age at death grouped into 10-year spans. 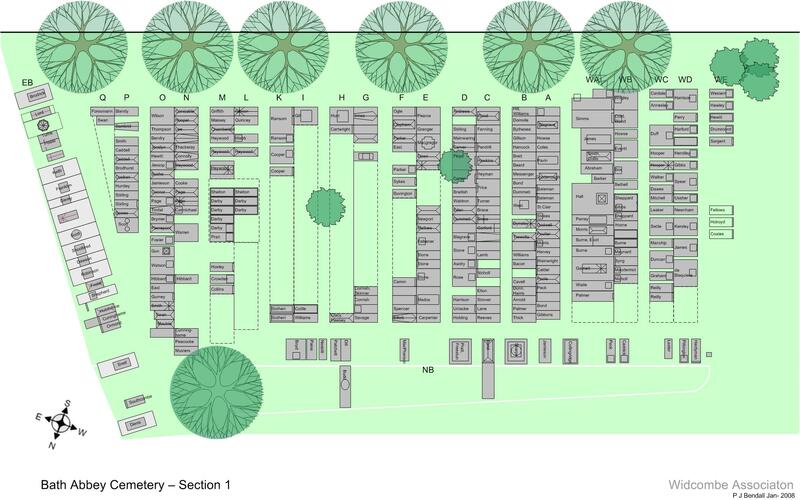 For the Abbey Cemetery it is notable that over 50% died over the age of 70 and there are more females than males in every age group except 0-10 years. 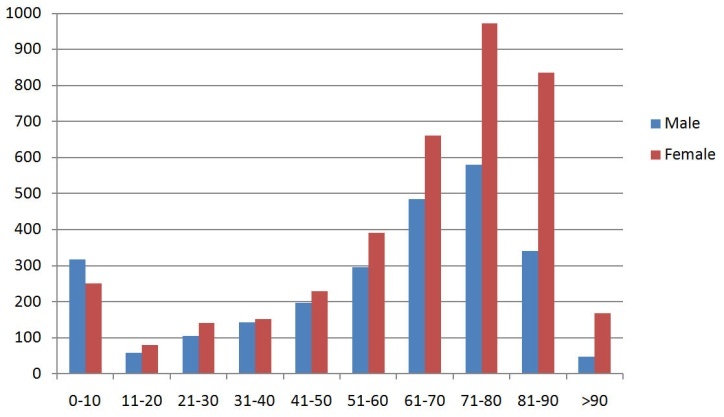 The age profile for the cemetery at St Mark’s, Lyncombe has a different form with about 43% of burials for children under 11 years and for other age bands a distribution that is almost flat. 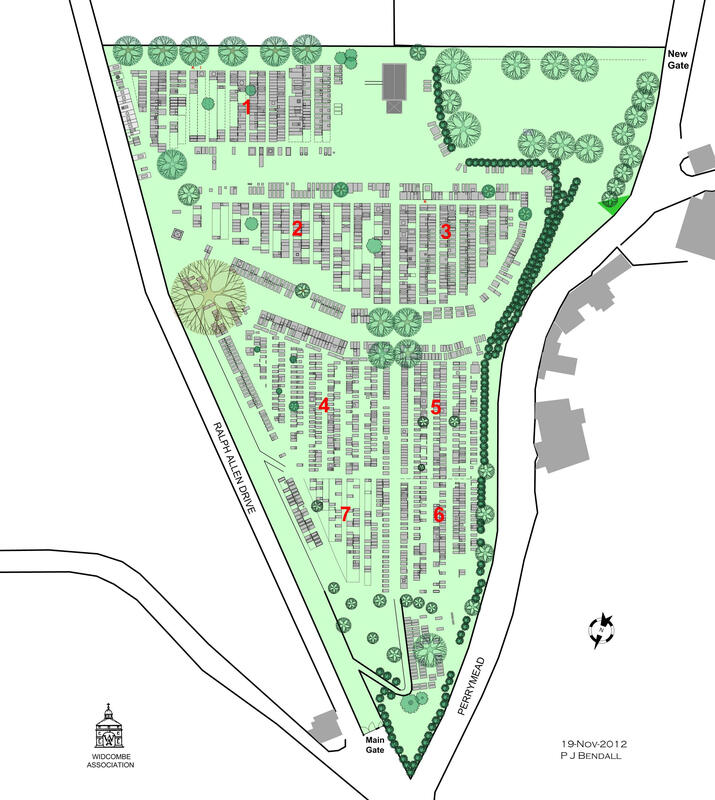 Those buried at St Mark’s were mainly artisans living in the parish, in Holloway, Claverton Street and Dolemeads. The country and, for Britain and Ireland, the county of birth have been sought. This has only been successful for about 70% of those buried, rather than relatives that are mentioned. 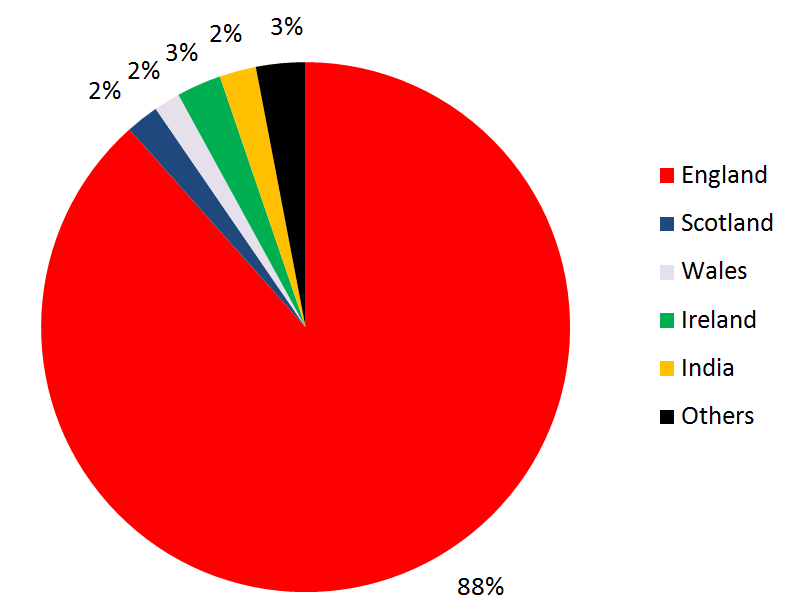 The populations of Great Britain and Ireland would suggest that the proportion from England would be about 80% and that from Scotland 10% if there was a random mixture of birthplaces. In fact, the occupants were mainly born in England. The number born in India is significant and arises from British families stationed there. Those born in Ireland include various English people who were posted there, either as clergy or in the services, and some landowners. Sheriff for Monmouth during the Chartist riots that occurred in 1839. Participated in the Battle of Waterloo in the 66th Inniskilling Dragoons which made a famous charge. A veteran of the Peninsular war who was a cutler in Westgate Street. The founder of the local engineering firm of Stothert & Pitt was buried in the crypt of St James’s church but various descendants connected with the firm are buried here. One of Queen Victoria’s bodyguards. Wife of a successful businessman in British North America. Mother and grandmother of MPs. A son was responsible for amalgamating various fur trading companies into the Hudson Bay Company. Husband and wife who were both novelists with most books written jointly. Some books were made into films. Admiral. He was one of the first to be awarded the Victoria Cross for a mission in Sweden during the Crimean War. Wife of a London attorney who founded various charities. A researcher into molluscs in Africa. His son Cyril was an eminent author and literary critic. Great-grandson of Horatio & Emma Nelson, grandson of their only child Horatia Nelson who married Rev. Philip Ward. Actor, manager of the Theatre Royal, Bath in the period 1827-1833 and lessee and Master of Ceremonies at The Assembly Rooms. A member of the brewing family but his career was in preaching, writing and training missionaries. Celebrated cricketer.1832-1855. 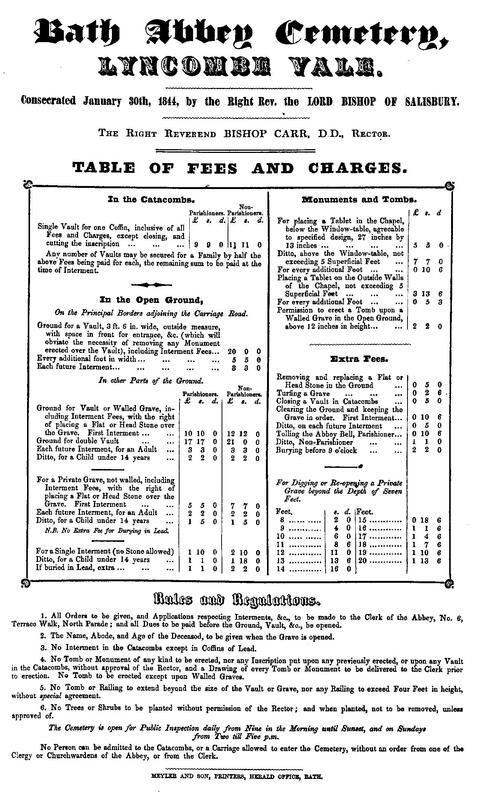 Established Fenner's cricket ground at Cambridge. Member of a family which owned a bank in Bath. Co-founder of Stothert and Pitt and his son who was a Managing Director. A notable actor and the great-grandfather of the American star of stage and screen Tyrone Power. A memorial exists but he was lost at sea. 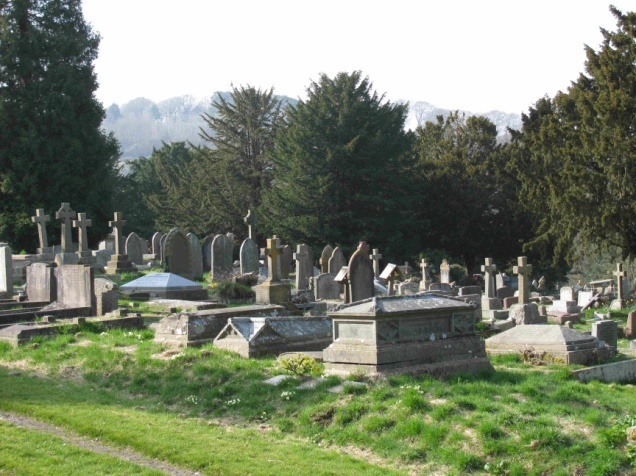 As a closed cemetery, maintenance is now carried out by the Council. During the summer the paths are mown every few weeks. There is an annual strimming which takes place in either November or December. During the summer the plants growing on and around the graves can become quite high and the best time to find a grave is in the period after the strimming until May. 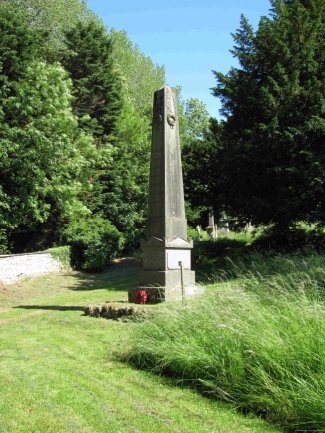 The cemetery is also the location of the city’s Crimean War Memorial. The obelisk has the names of key battles and a general. On the plinths are the names of those with connections with Bath who died in that war. Parking is available in nearby Perrymead and it is also possible to drive into the cemetery up to the chapel. 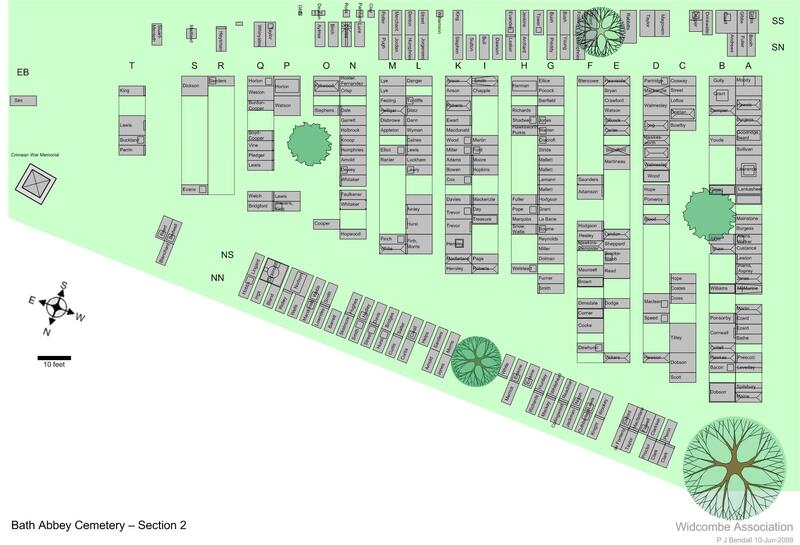 The main gate can be opened by going in via the pedestrian gate and turning the metal bar that keeps the gate closed. Care must be taken driving through the gateway due to the change in incline. Parts of the upper driveways can prove difficult when the ground is wet. The buses between town and Combe Down have stops just outside the gate. 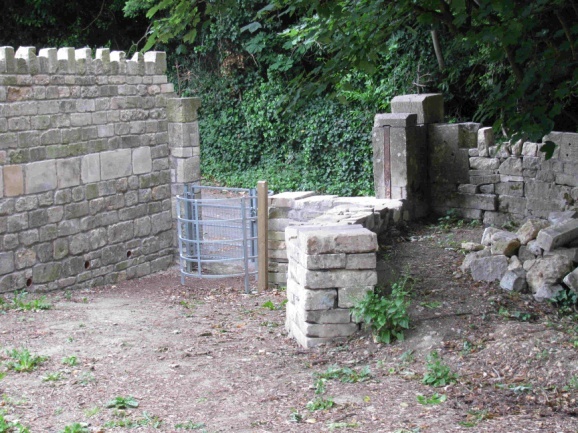 The Cotswold Voluntary Wardens, with support from the Council and the diocese, have cleared the overgrown, wooded area in the southwest corner of the ground which was never used for burials. They reinstated the path from the chapel to the southwest corner and installed a kissing gate, allowing those visiting to the cemetery to walk into Perrymead. 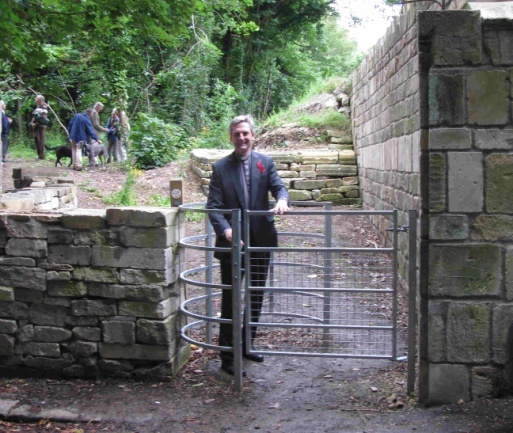 This was opened by the then Mayor of Bath, Bryan Chalker, in June 2011. The Burial Order Books which list the burials and where they took place are in the possession of Bath Abbey. 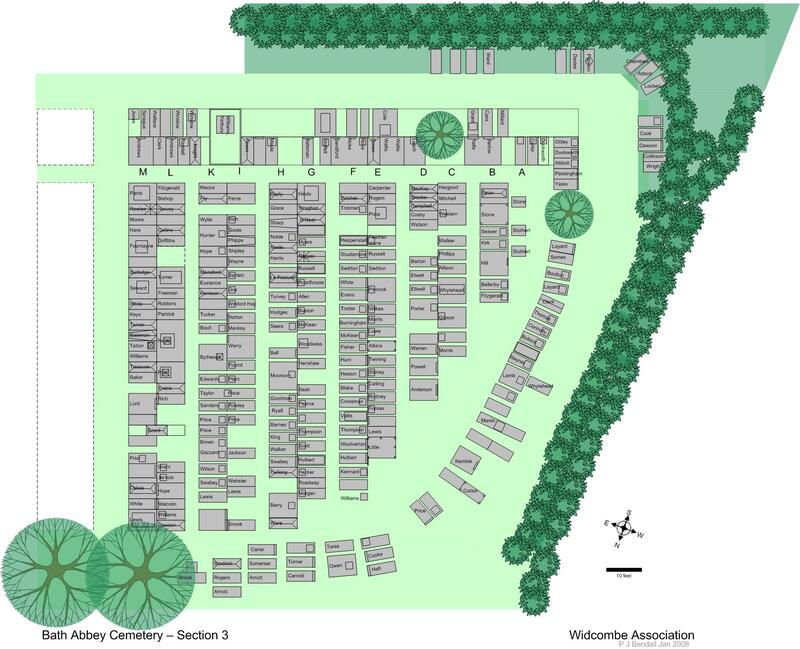 The burials and memorials in the cemetery have been documented by the Widcombe Association by surveying and mapping the surviving memorials and using the burial order books and burial registers. This includes a history of the cemetery, maps of the sections and rows, the inscriptions and photographs of the memorials along with supporting information on the individuals. 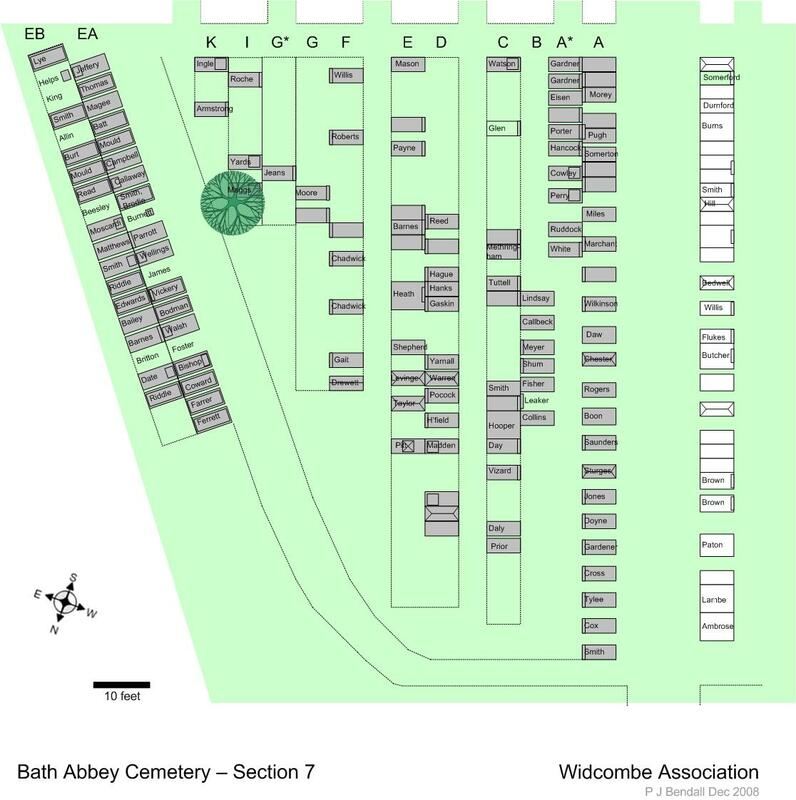 A copy of the volume documenting the cemetery produced by Widcombe Association is available on a CD at Bath Record Office.  The index (but not the CD) is available as a bound volume in the Local Studies section of Bath Central Library. 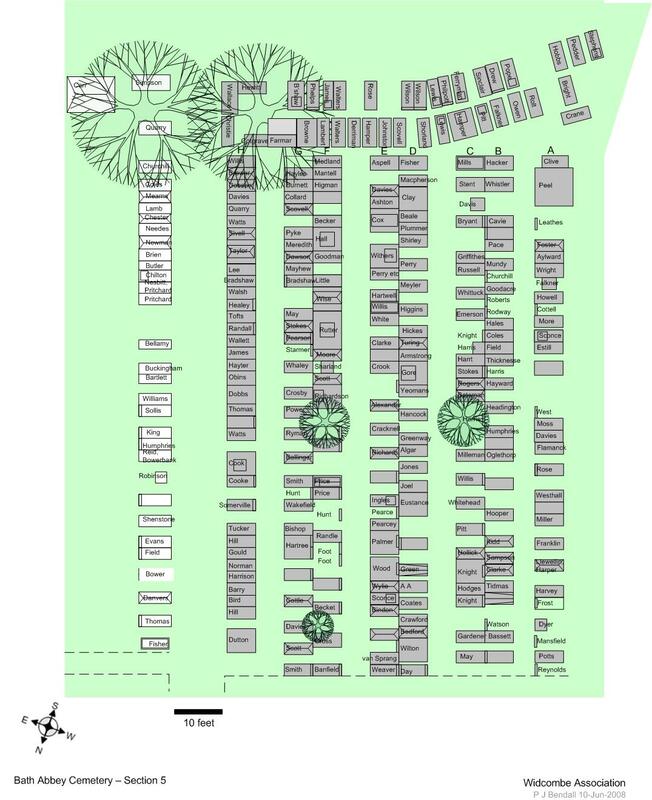 Both locations have maps of the cemetery. Widcombe Association sells copies of the CD; see its website www.widcombeasociation.org.uk . 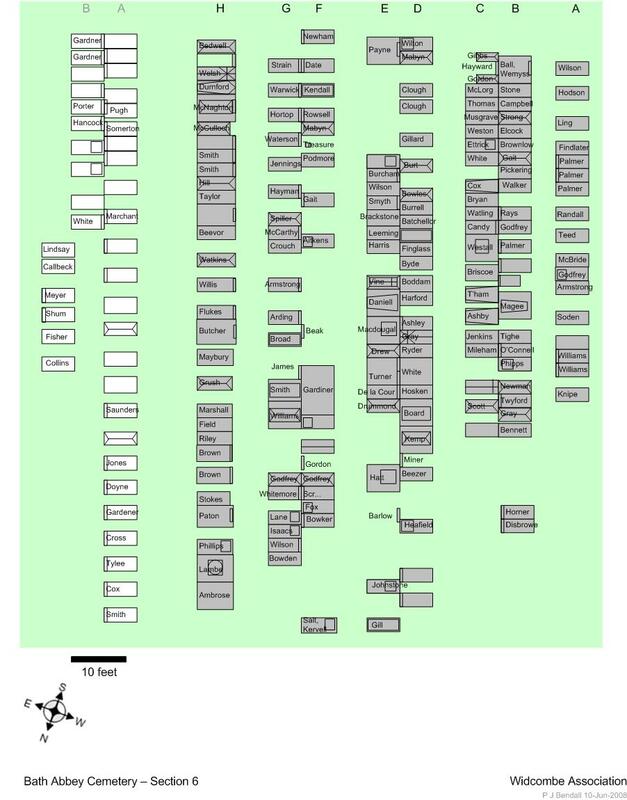 The cemetery is covered by The National Burial Index version 3 based on information in registers provided by the Somerset & Dorset FHS but does this not give the locations of graves. In addition, as noted above, the number of records does not accord with the number of burials. 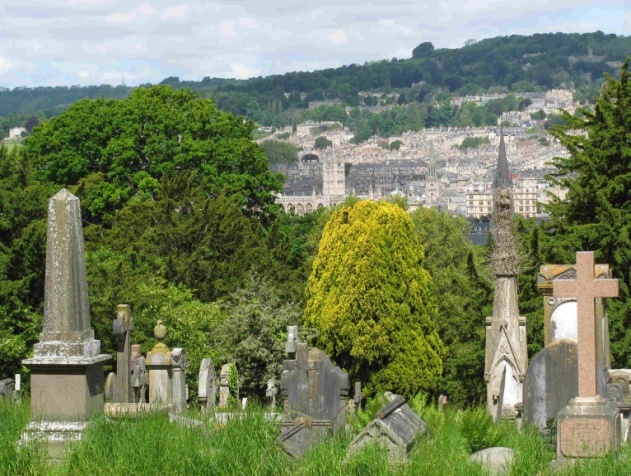 If you wish to view and search burials within this cemetery, please visit the Bath Burial Index search page.